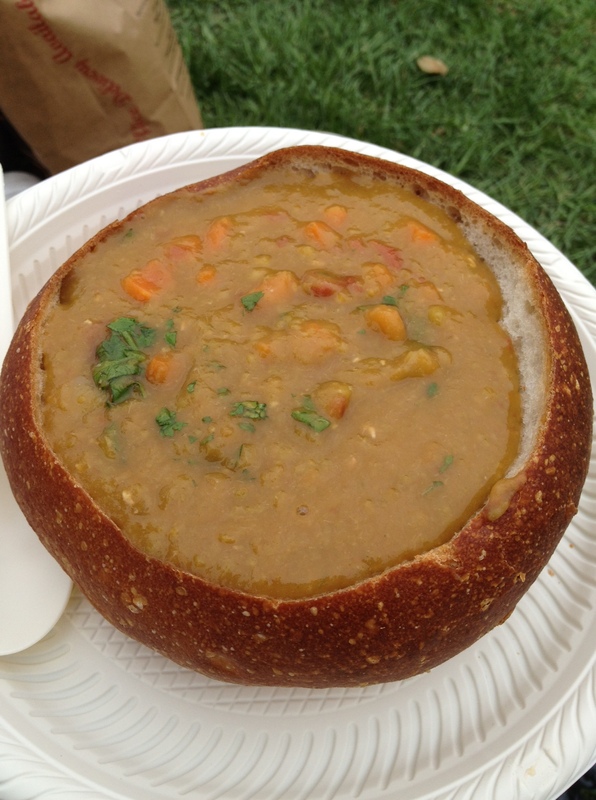 Now that I’ve cooled down from my San Francisco Street Food Festival excitement, I can let you in on some of my other recent food truck experiences. 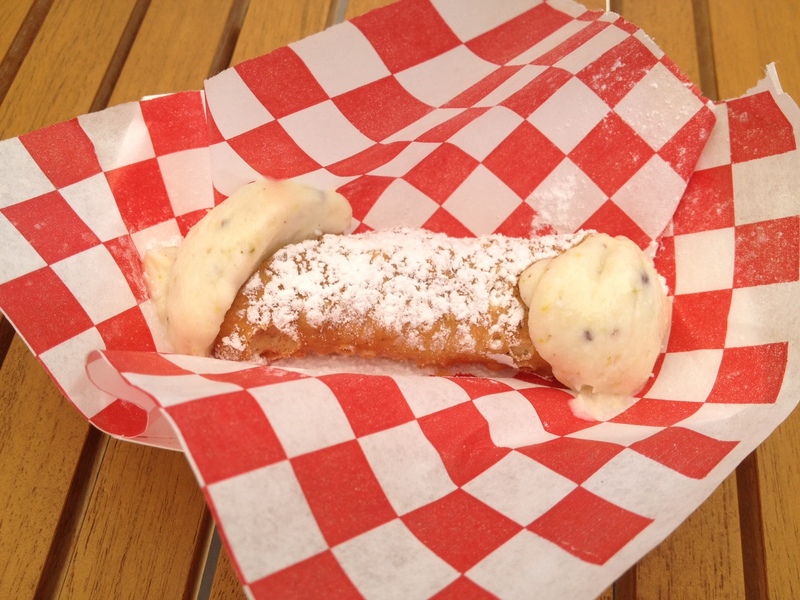 I’ve been to four new trucks in the last month or so and tried new dishes from a few others. 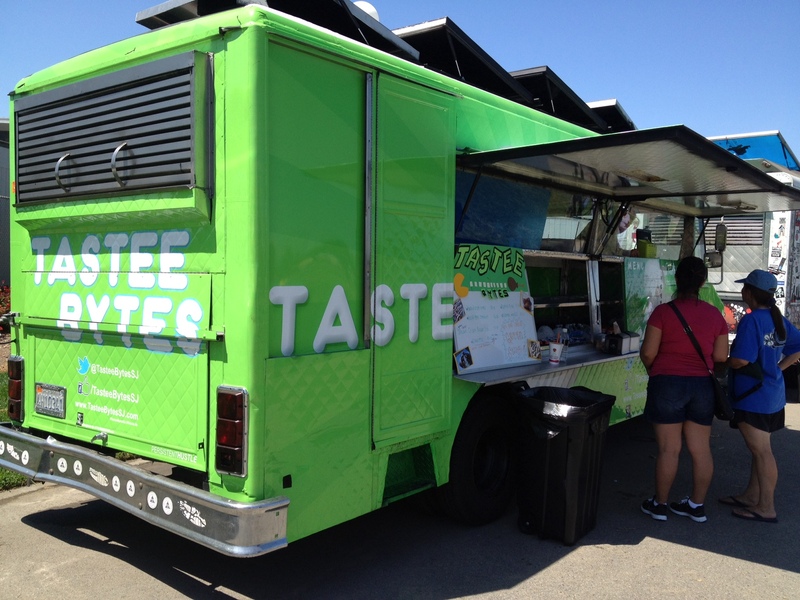 The first new truck I visited was Tastee Bytes. Tastee Bytes is sort of limited in the vegetarian options department. They have a churro and the tastee fries, and that’s about it. Kyle and I decided to try the tastee fries on a Saturday afternoon a few weeks ago. 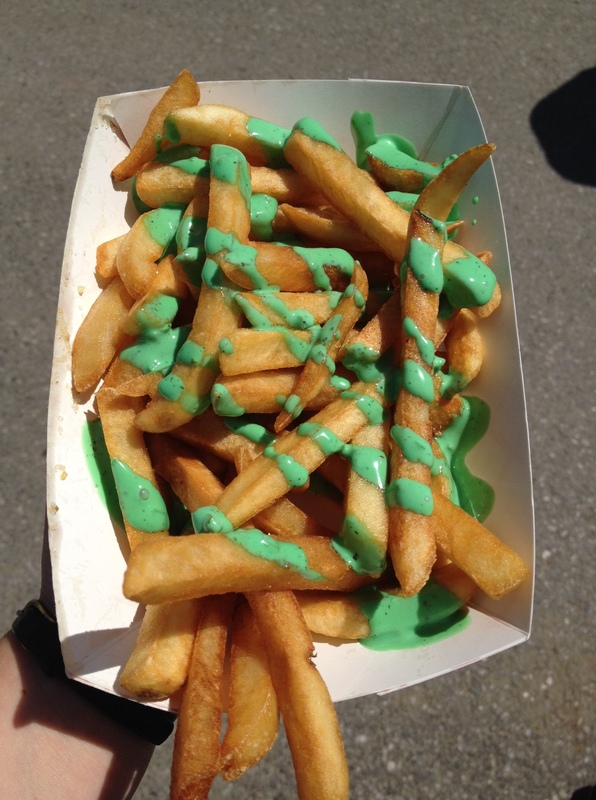 We were a little surprised by the bright green color of the sauce once we received our order, but it definitely matched the color of the truck. They were your run-of-the-mill fries, nothing to write home about. I wouldn’t go out of my way to get them again, but if they added something else vegetarian to their menu I might order some fries on the side. 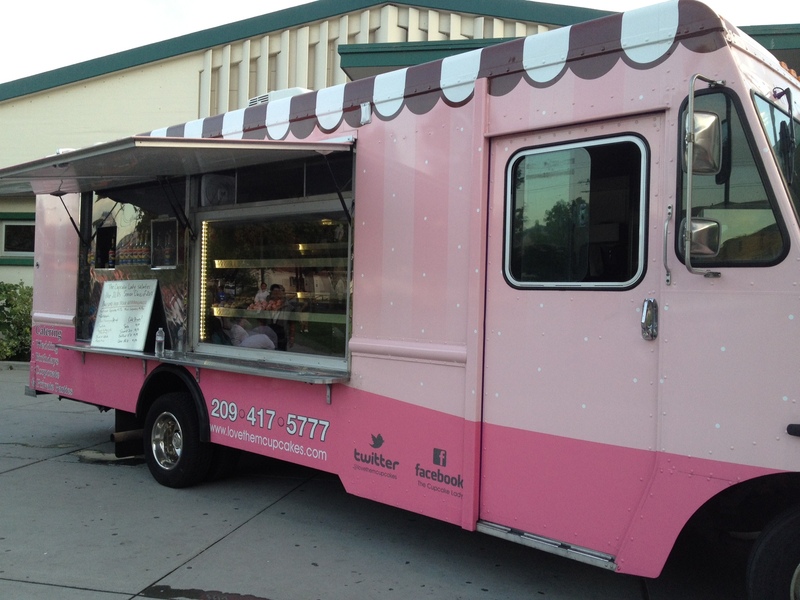 Another new truck I’ve recently tried was The Cupcake Lady truck. This truck seems to hail from the central valley, but they were in San Jose for a fundraiser at a local high school. Kyle ordered a black and white cupcake. 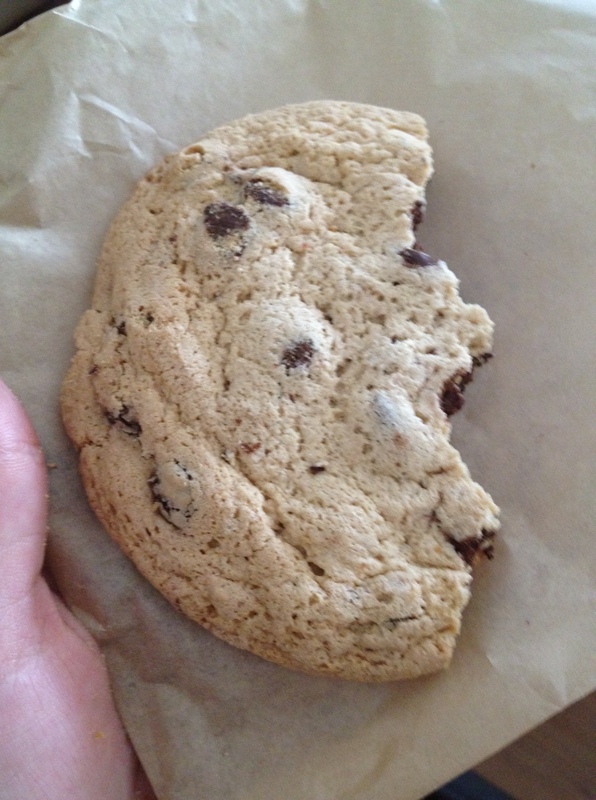 After I bit into it, I realized the “white” part was marshmallow and didn’t have anymore. No gelatin for me, thanks! I guess we should have asked what the filling was before buying it. 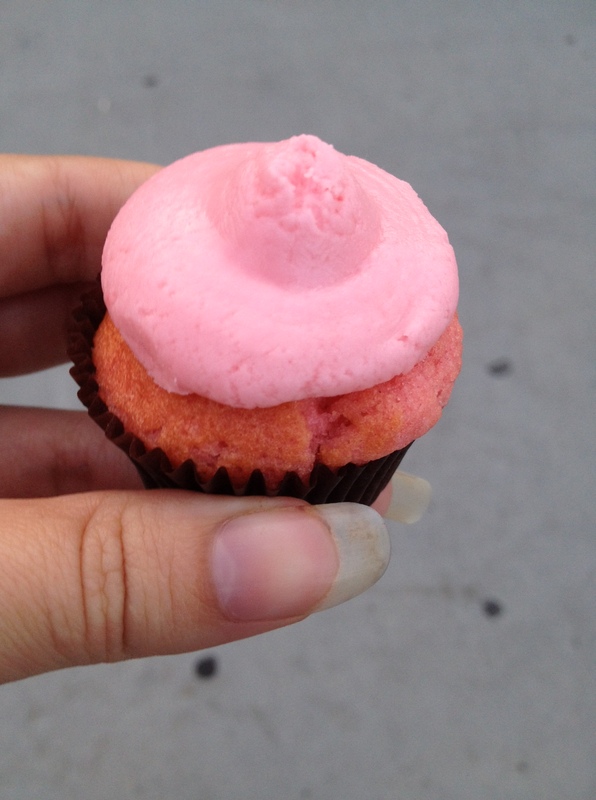 Wanting to still try a cupcake from the truck, I went back and got a mini pink champagne cupcake. 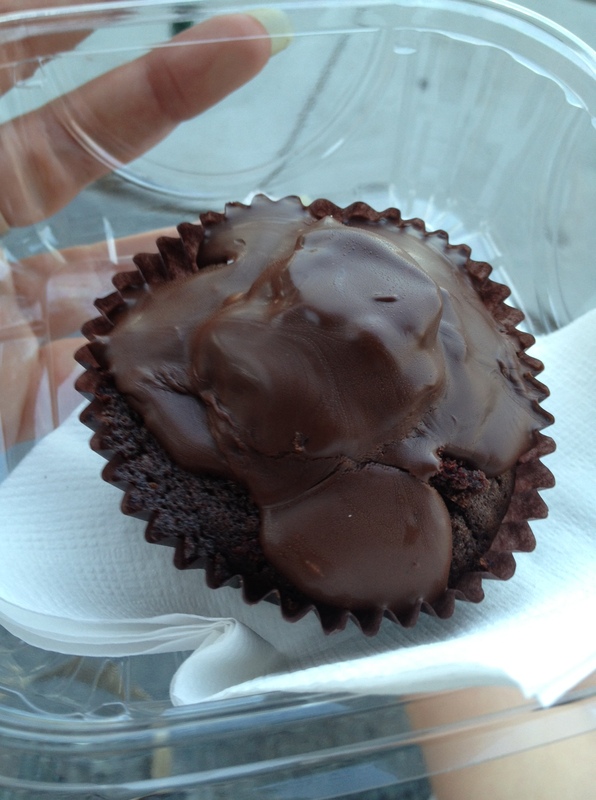 It was a little dry and flavorless for my liking, but I might be spoiled by some of the other cupcake trucks in the area. Just last night I visited another two new trucks at the new weekly truck event The Winchester Truck Fest. 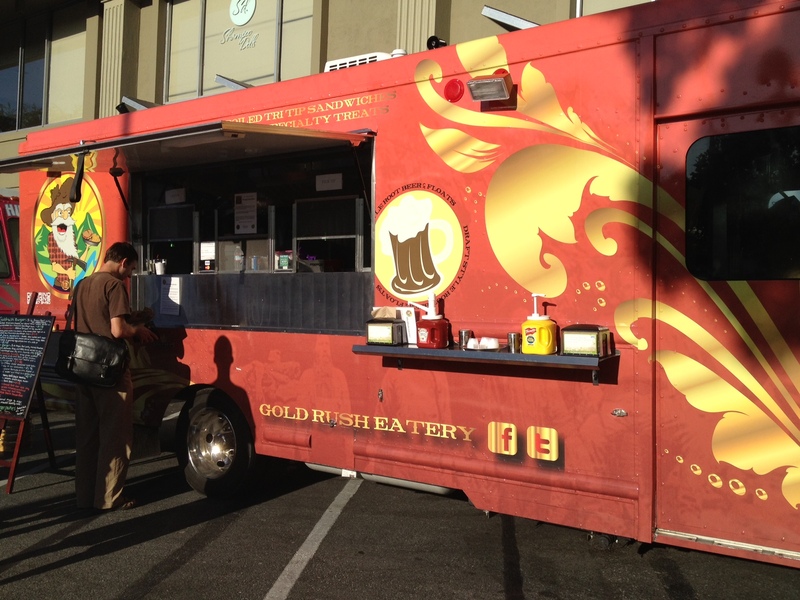 The first was Gold Rush Eatery, a new California history themed truck. I was happy to see that any of the burgers on their menu could be substituted with a veggie patty. I went with their basic burger. The highlight of the burger was definitely the sourdough bun it was on. As you can see with the following close up, the burger didn’t consist of much besides cheese and sauce. I would have preferred some more veggies, but that just means I need to explore their menu a little more. 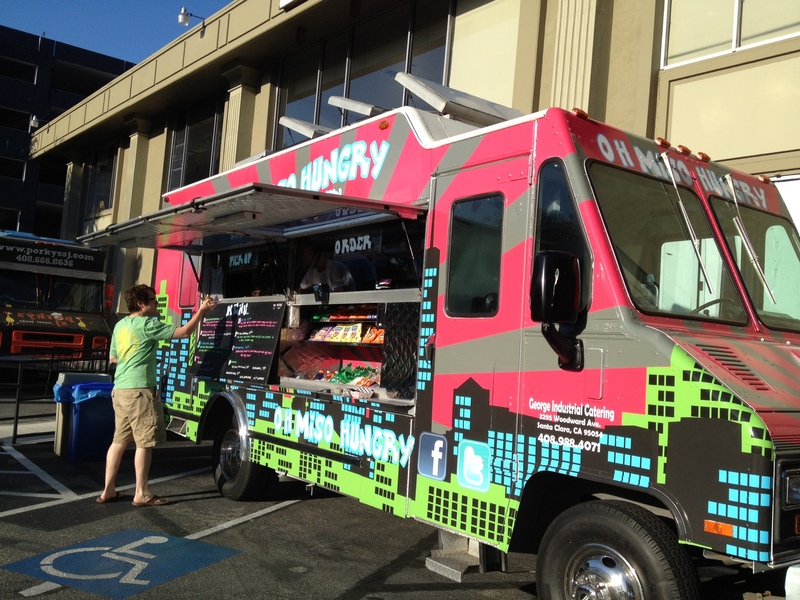 The next new truck I checked out was Oh Miso Hungry. 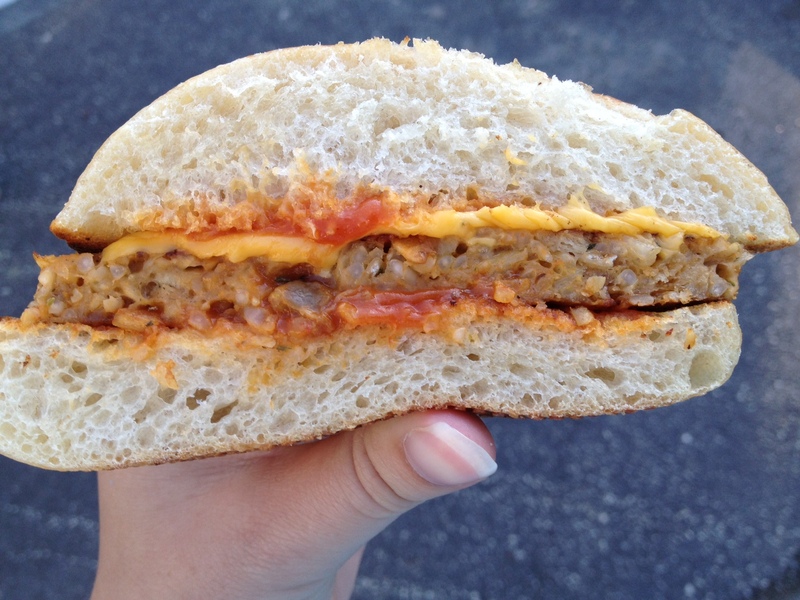 When Kyle asked if their kimchi grilled cheese included shellfish, we were happy with the response that it didn’t. 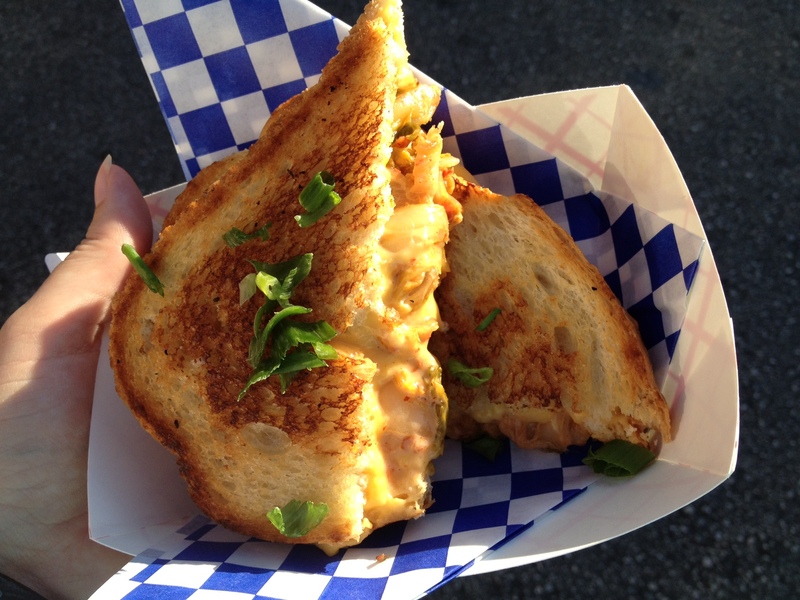 We are both huge fans of both kimchi and grilled cheese, and this was a match made in heaven. 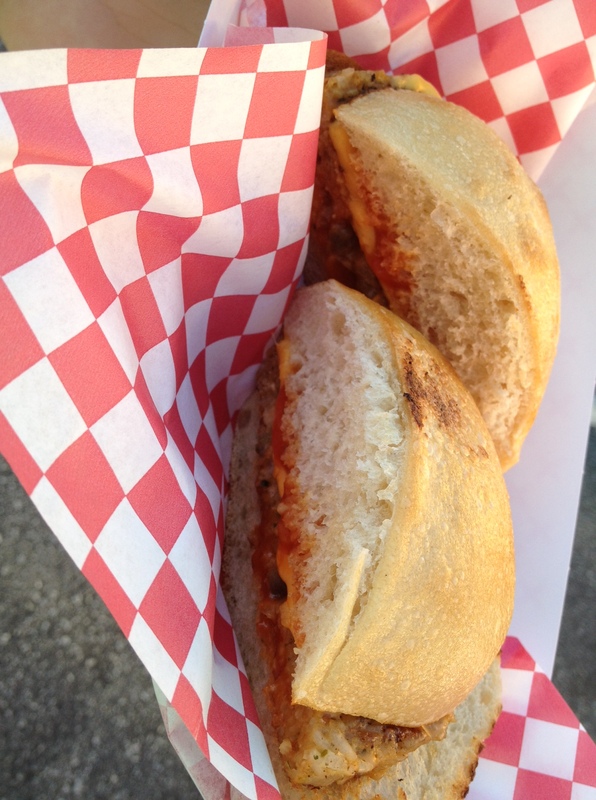 The sandwich was delish! I haven’t only been going to new trucks though. 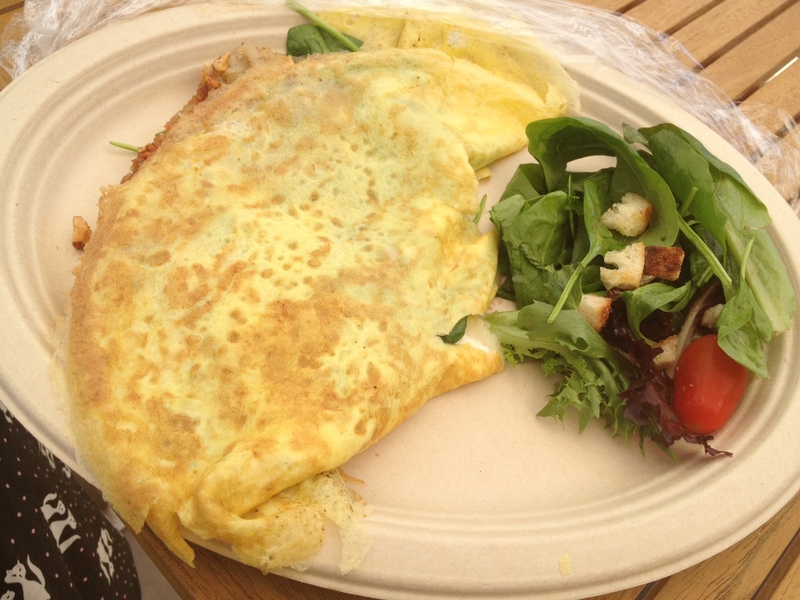 I’ve been going back to old favorites, and I’ve especially enjoyed a few different options from Banjara Bistro. 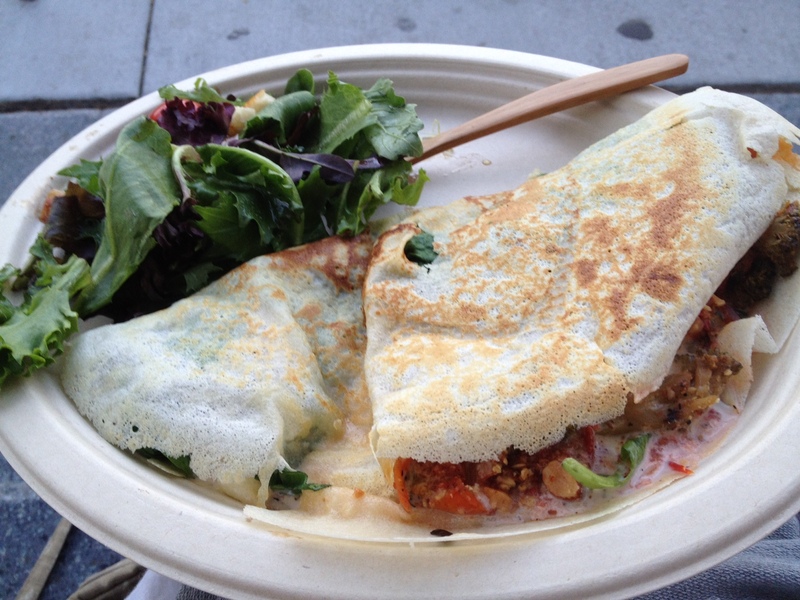 Since my first visit there, I’ve been back twice and tried their vegetarian crepe and vegetarian omelette. 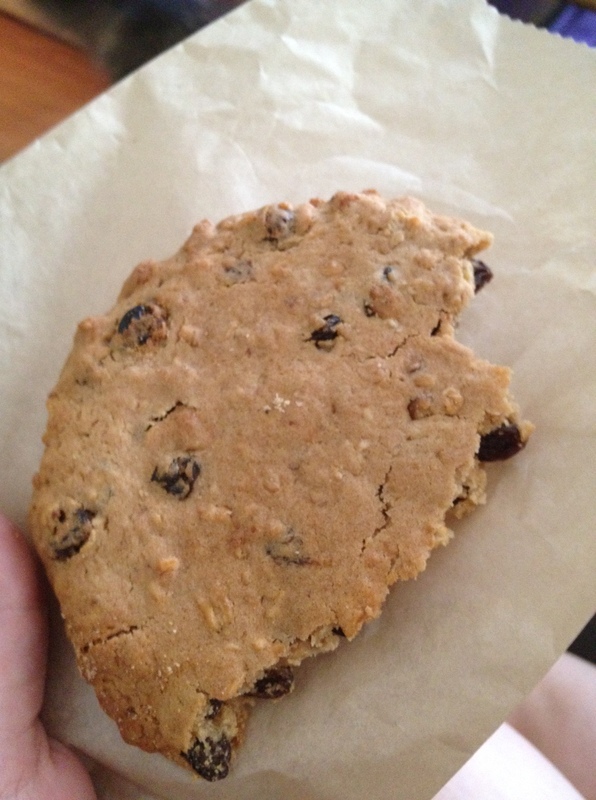 They tend to have the same ingredients as the sandwich, but they are such delicious ingredients I don’t mind at all. 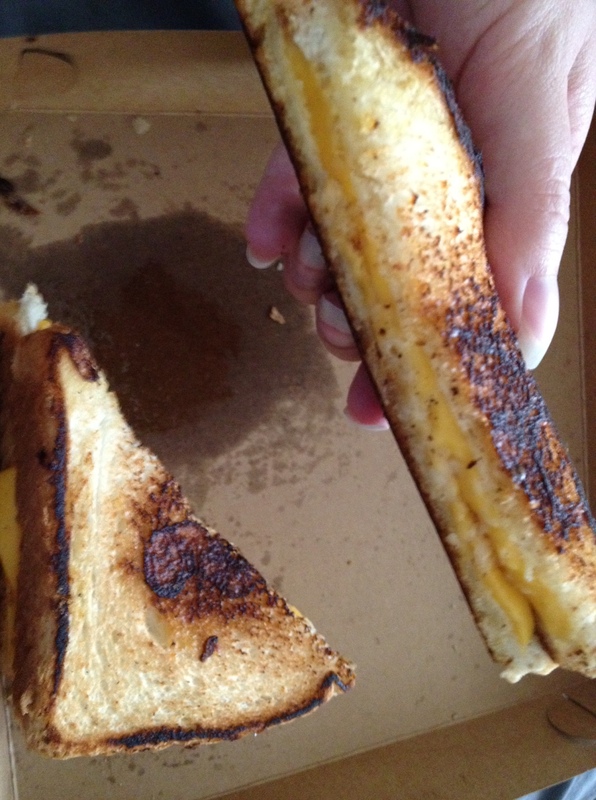 I also got to try Grilled Cheese Bandits for a second time. This time, I got the Bandit, a somewhat traditional grilled cheese with three kinds of tasty cheese in it. 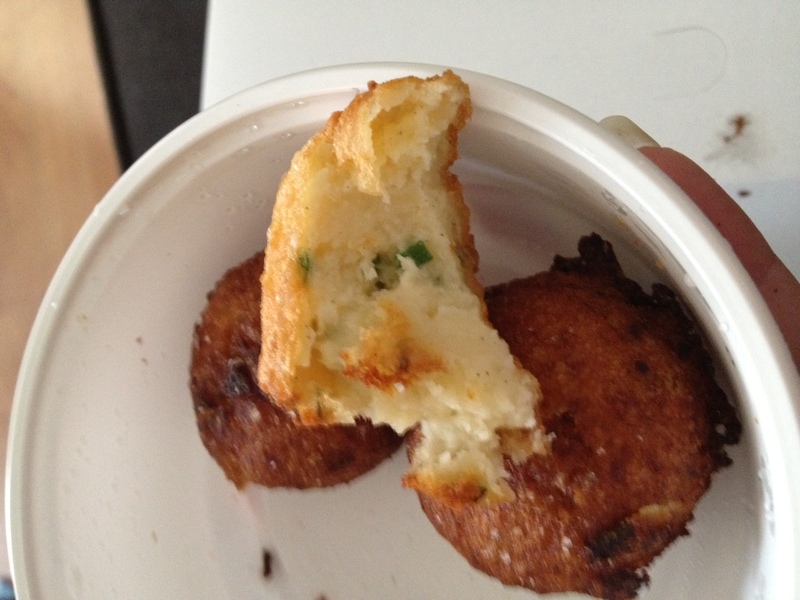 I also tried their mashed tater balls, which are exactly what they sound like: mashed potatoes molded into a-little-more-than-one-bite-sized balls. I especially liked the seasoning they had on them. 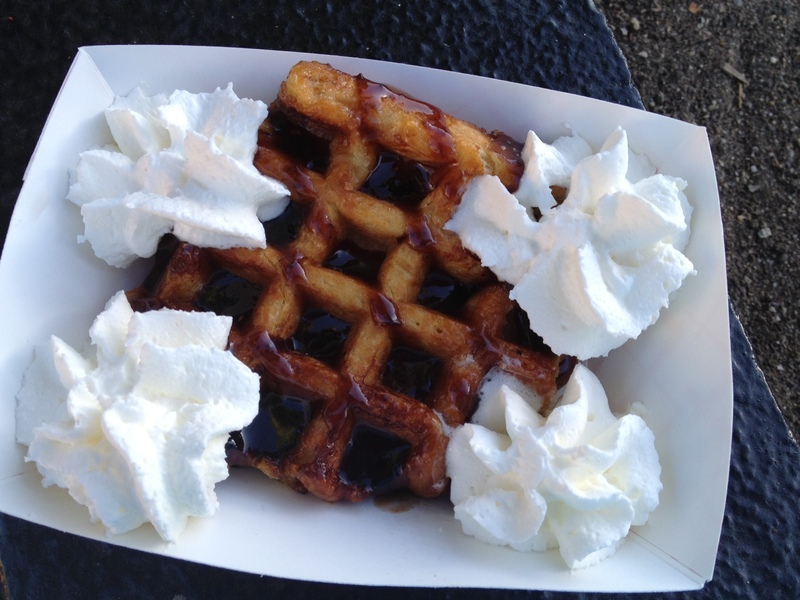 Following are a few more photos of dishes I’ve tried from trucks I already enjoy. 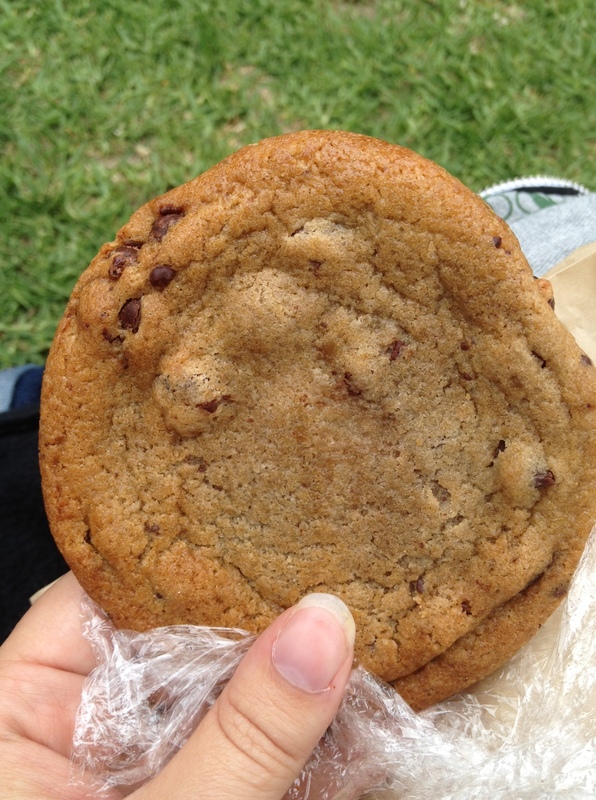 You can consider them all yummy and recommended.